Certain things mark the unofficial end of summer for us, like back to school or Labor Day weekend. For me it's the start of Mercedes Benz fashion week in New York City. Yesterday kicked off the first day of the spring 2014 runway shows. The pieces seen on the runways will mark the upcoming trends for the next season. After reviewing the runway and presentation pics, there are some trends I'm hoping creep back where they came from, like the um, sporty Native American chic seen on the Nicholas K runway. Maybe I was just blinded by the styling. In any case, the slouchy and sporty silhouettes were a common theme in several collections. I can't say I'm thrilled. I think a woman should dress like a woman, not a homeless man who is wearing a donated overcoat that is three sizes too big. The trends I did like were some carry-over trends from this year - interesting cut-outs, modern florals, and punk-inspired elements. I was most impressed by the traditionally feminine yet modern gowns by Tadashi Shoji (pictured right) and the edgy gowns by Supima (bottom right). American designer Richard Chai also sent some incredibly slouchy designs down the runway, including sporty skirt-pant combos. I'm not a huge fan, though he had a few dresses I absolutely love (pictured below). 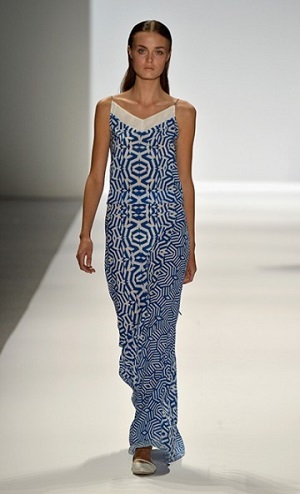 BCBG Maxazria, usually one of my favorites, displayed a few too many over-sized tent dresses and baggy slacks. I'm hoping to see more of both the edgy and the classically girly trends. Although, if the rest of fashion week continues in this direction, I think it's safe to say that the ultra-feminine and vintage-inspired silhouettes of 2013 are on the way out, only to be replaced by baggy sportswear, at least from the American designers. Yet there is still hope; I've seen some instagrams from my favorite style bloggers at the shows this morning, and there seems to be some more femininity coming out at the Zimmerman show. Paris Vogue also posted the Spring/Summer 2014 ready-to-wear collection by Red Valentino, and it couldn't be more girly, with plenty of lace, ruffles, and the short fit-and-flare skirts from this year. Images via Mercedes-Benz Fashion Week.